Olympia Time: What would it mean for the nature of our city that the Missing Middle would have the biggest impact on Southeast Olympia? What would it mean for the nature of our city that the Missing Middle would have the biggest impact on Southeast Olympia? Southeast Olympia is already wealthy and conservative. Would allowing more housing types down there change that? The above map is a mashup of two different maps. The first is a parcel density map of where the Missing Middle recommendations would have the greatest impact. It shows where the buildable parcels left to be developed match up with the potential for Missing Middle housing. For those just showing up, Missing Middle is the variety of housing between an apartment and a single-family home, such as a townhouse, duplex or courtyard apartment. The second map (which is displayed in white to red placemarks) is the election results from the Lisa Parshley vs. Allen Miller race last November. Miller districts (more conservative) are lighter, Parshley districts (more progressive) are darker. 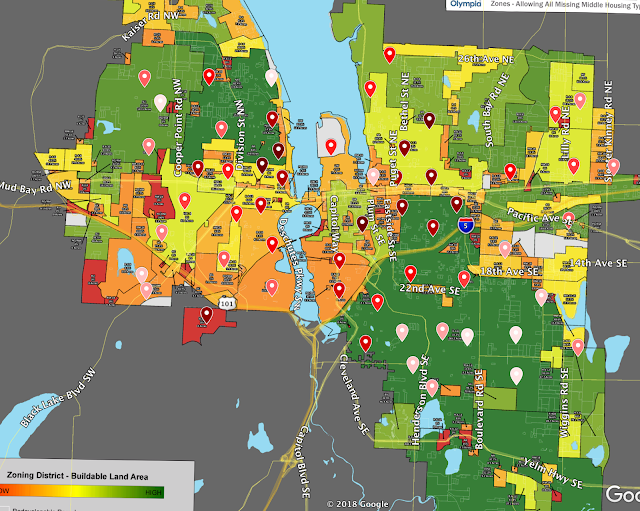 Now, this isn't an exact science but what this map tells me is that the neighborhoods with the greatest potential for growth from Missing Middle housing are far more conservative. To me, it totally follows that neighborhoods that are less dense, with bigger yards and longer commutes, would be the more conservative. And, it turns out, much wealthier. This next map is a selection of a map that shows how income really is distributed across the city. Some of the wealthiest parts (here in deep red) are in the same sections, down in the Southeast side of town where Missing Middle is hard to find, but the potential is the greatest. 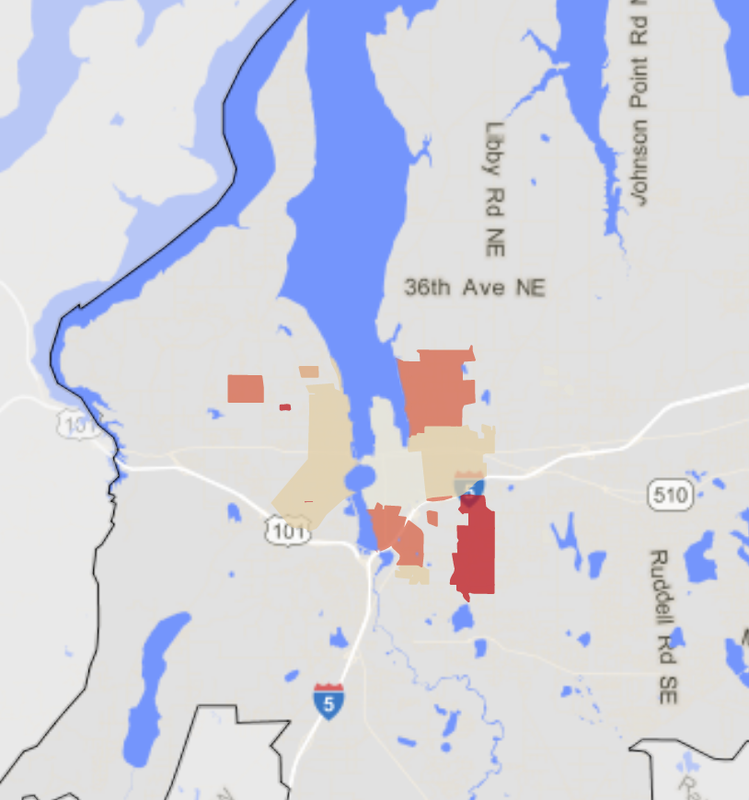 So, imagine a scenario where Missing Middle housing becomes available across the broad swath of Southeast Olympia. What happens to the grassy, large single family home dominated section of Olympia? Does it become more progressive? Does it become more egalitarian?